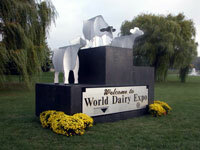 As the sign says, “Welcome To World Dairy Expo.” I just got on the grounds and set up in my office but I’ve already got a lot of pictures to show you. This will be a little like a travelogue in a way as I try to give you a flavor of what it’s like on this last setup day. After the event I’ll be taking all the photos and making them available in an online photo album. After leaving my hotel this morning it was just a short drive to the Alliant Center. Right out front is this welcoming committee and sign. It’s a beautiful morning. The sun is just starting to poke out of the early clouds. It’s getting warm and it is humid but that’s all going to change in just a couple days.